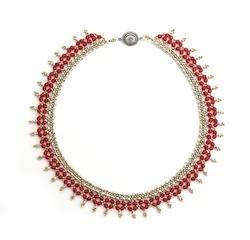 When it reigns By Isabella Lam - Weave a regal collar with jewel-tone fire-polished beads and picots of metallic seed beads. 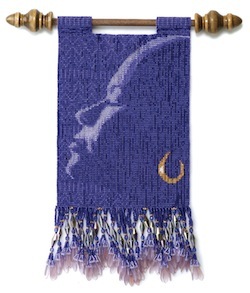 Hollywood squared By Donna Sutton - Stitch your way to a dazzling Tila bead cuff studded with seed beads and two-hole crystal settings. 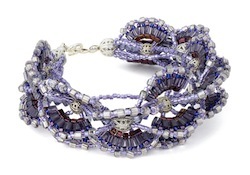 The base of this bracelet is constructed using modified square stitch, securing new rows of beads to previous rows of beads rather than stitch one bead to one bead as in traditional square stitch . 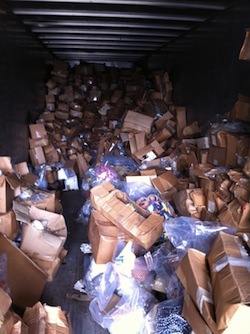 Backstory: Uncovering the bead hoard By Suzanne Branca - A string of owners gets the surprise of their lives as a stockpile of vintage beads and findings trades hands over the decades. 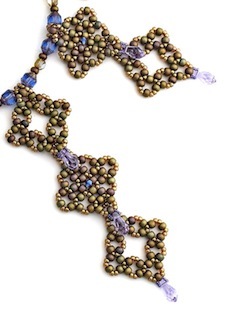 Vines and flowers By Jackie Schwietz - Combine stitches to create a feminine bracelet. 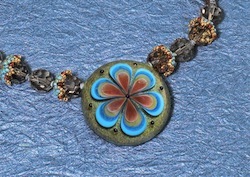 Add crystals, branches, buds, flowers, and leaves to a peyote base for a nature-inspired bracelet design. Clasp it with a button to complete the romantic look. 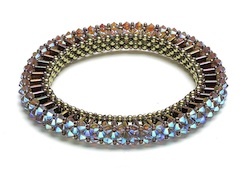 Standing ovation By Anna Elizabeth Draeger - Nothing turns heads like the flash of Swarovski Elements, and these fashionable bangles sport a solid ring of those eye-catching crystals along its outer edge. 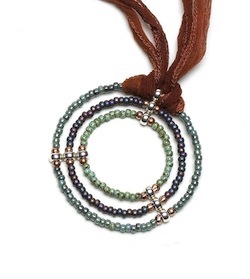 The spoke-like structure provided by Miyuki Tila beads or Czech two-hole tile beads stitched in cubic right-angle weave elevates the design, while the inner ring of pearls provides a comfortable base layer that makes this bracelet easy to wear. 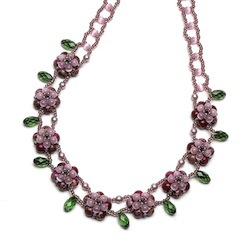 Spring fling By May Brisebois - Combine fiber-optic glass and gemstone beads with crystal briolettes to make a lovely crossweave necklace reminiscent of cherry blossoms. In crossweave technique, two needles cross through a bead (or beads) so the needle that was on the right side is now on the left side and vice versa. 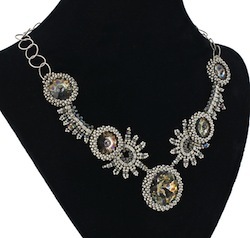 Supernova By Kelli Burns - Connect peyote-bezeled rivolis with arcs of ladder stitch, modified herringbone stitch , and picots for an out-of-this-world necklace. 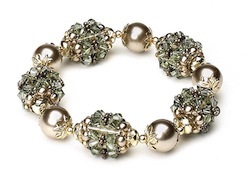 Filigree fanfare By Nealay Patel - Form fans of cube beads, triangle beads, and seed beads into an undulation bracelet built on beading wire strung through filigree findings. Artist Profile: Beadng the farm - By Margaret A. Haapoja. 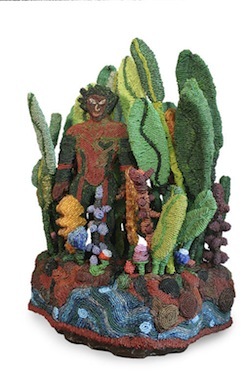 Artist A. Kimberlin Blackburn makes beaded sculptures that capture the spirit of the harvest. Captured cosmos By Jenny Van - Use crossweave technique to create a two-sided beaded bead as colorful and intricate as an interstellar cloud. Attach curved-link spokes interspersed with bicones and oval crystals for a perfectly proportionate pendant. In crossweave technique, two needles cross through a bead (or beads) so the needle that was on the right side is now on the left and vise versa. 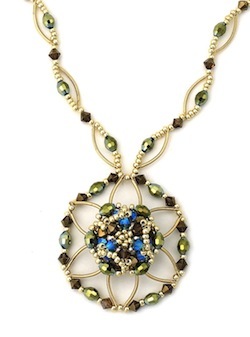 Crop circles By Julia Gerlach - Concentric rings of seed beads create a lightweight and modern pendant. 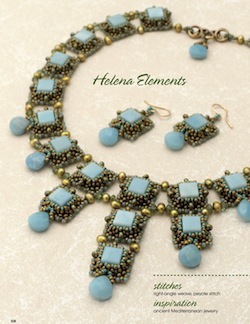 Design Workshop: Right-Angle Weave By Anna Elizabeth Draeger - When we saw the clever components in Hattie Newman's Arabesque necklace (pictured), we wanted to share an array of design options possible with the main diamond shapes. Connect one simple stitch in several ways to create your own design elements. 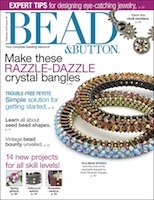 Quick Stitch: Bead Weaving By Samantha Mitchell - Wrap crystal clusters with ribbons of seed beads and top them off with a crystal bow, creating a glittering accessory perfect for gifting. Expert Advice: Design & color mastery By Margie Deeb - Welcome to the first of a six-part series on mastering jewelry design, starting with four essential techniques for grabbing the gaze of your viewers. Enchanted gazebo By Laura Landrum - Construct open-air beaded beads with bugles, pearls, and crystals, and then string them with bead caps, rondelles, and pearls for a classy vintage look. Reversible rainbow By Deborah Anderson - Make a four-color Skinner blend, and then add detail with rubber stamps and ink for a refined bracelet. 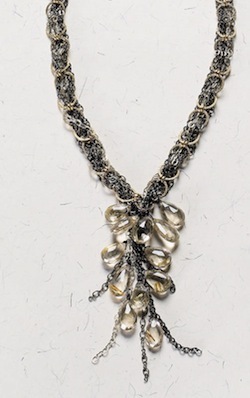 Chained reaction By Angela Casaccio - Combine large- and small-link chain in mixed metals with wire-wrapped briolettes for an up-to-date delight. Splish splash By Julia Gerlach - Julia Gerlach talks about designing with Beau Barrett's hollow blown borosilicate bead in Spotlight Designs.